Professional Pest Control in Dartford. You saw a rat in your basement? Don’t panic, leave it to Thomsons Cleaning expert company to resolve any problem you have with unwanted pests. We have years of experience of providing professional, safe and efficient pest control to the commercial and domestic clients in Dartford DA. 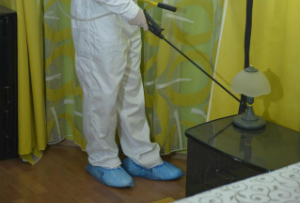 We have trained, certified and vetted pest control specialists. They work with pesticides and insecticides from an approved UK provider. They have the skills and are equipped to deal with any rodent or insect infestation as well as to ensure that future infestations are prevented. If you want a free price quote for a certain pest control service make sure you contact our 24/7 customer service center. Contact 020 3746 0000 or send us an online price quote request here. You will be asked to remove any domestic pets, even fish from the property prior to the treatment. Also, all the premises which will be treated need to be thoroughly hoovered. Nobody should remain in the property while the treatment is being performed or two hours after it. Do not worry, all of our pest control technicians in Dartford DA are reliable, police record and vetted. Once you return after the two hours have passed, you need to open all doors and windows and leave them open for 10 minutes. After the treatment, the property shouldn’t be hoovered for four days. If you pick the guaranteed service, the specialist will perform this twice more in the next two months for free. So, if you have annoying pests or want to prevent infestations, do not wait to choose our pest control services today! Thomsons Cleaning is known among the private local businesses and residents of Dartford DA as a trusted provider of pest control services for over a decade now. Only thoroughly background certified, checked and experienced pest control experts work in our company. They are comprehensively trained to work properly and safely with all the different insecticides, pesticides, traps, etc. solutions and tools. We offer our clients a choice for a guaranteed pest control service with a three month guarantee. The pest control technician will make another two free visits for preventive treatment in the two months following the initial treatment. We will help you deal with infestations of crawling insects, such as: ants, cockroaches, spiders, dust mites, woodworms, fleas and silverfish. We can also help you get rid of the annoying flying insects like: bees, wasps, flies, moths or carpet beetles. Our pest technicians can also deal with rodent infestations, including: mice, squirrels and rats. We can also help you limit the access of pigeons or future infestations too. Initially, the Dartford DA pest control technician does a thorough and detailed inspection of the property in order to determine the source, type and level of infestation, as well as possible future entrance points. You will be given a detailed report with all this information, plus very detailed safety instructions about how to prepare for the actual treatment. Once all the precautions are taken, and the instructions are followed, the pest control specialist proceeds with the treatment with the appropriate solution or tools. Our customer care operators in Dartford DA are available non-stop. Contact 020 3746 0000 or fill out the online booking form for your booking request for pest control. They will send you a written confirmation within a few hours. You can book emergency, same day pest control services. Otherwise you can pick any day of the year. There is no deposit for booking. You get discounts if you combine more than one of our services at once. You will get preferential prices if you book early, if you are an estate agency, a regular customer or a landlord. Book now!